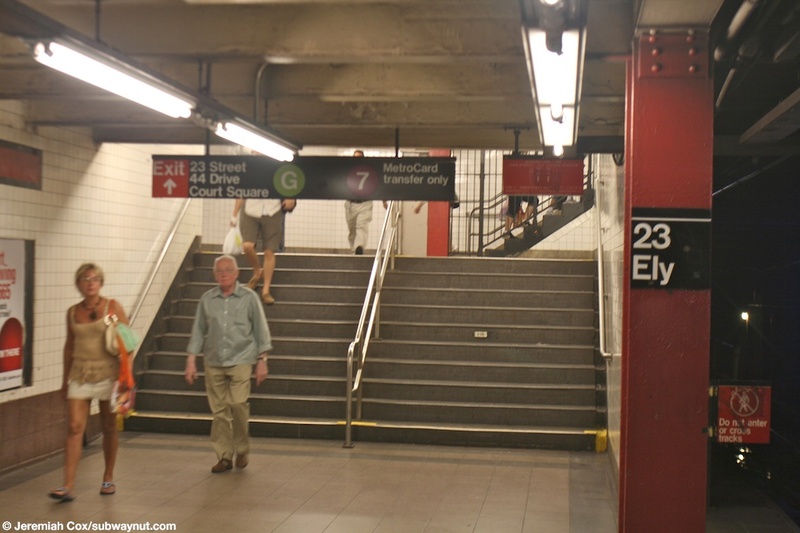 23 St-Ely Avenue, renamed Court Square-21 Street officially when the perminant transfer from the G train to the 7 opened on June 3, 2011 although the tiling wasn't changed. 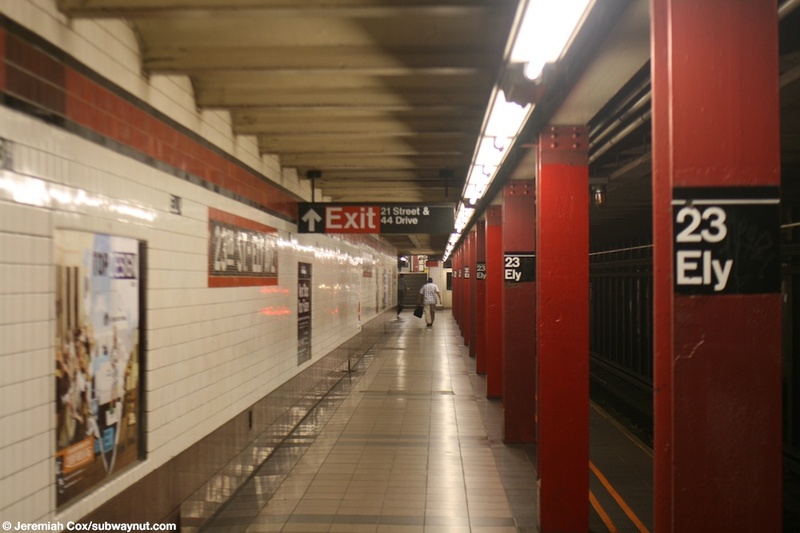 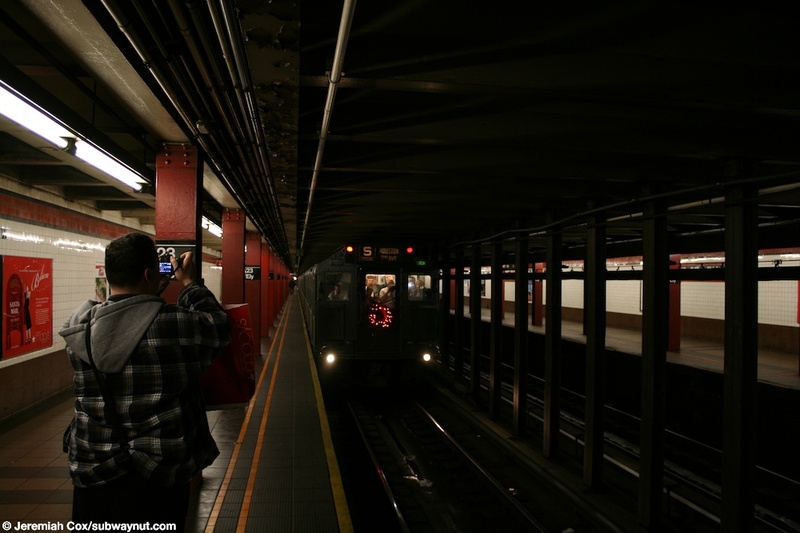 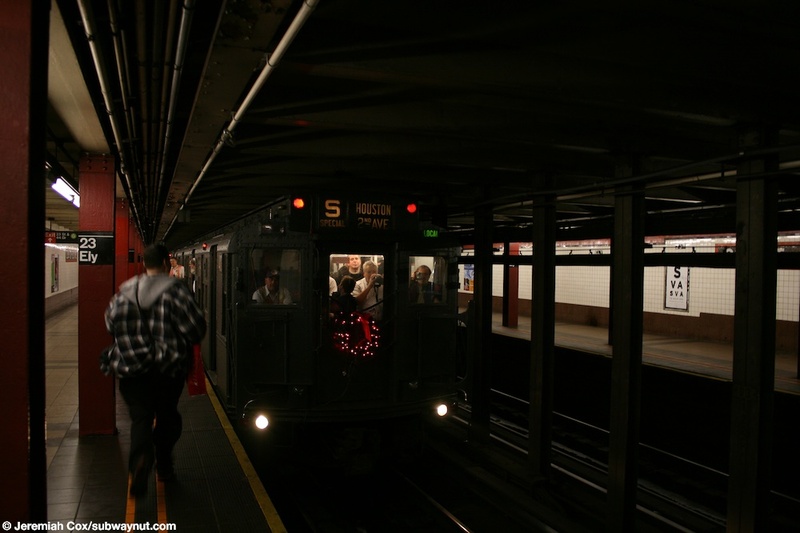 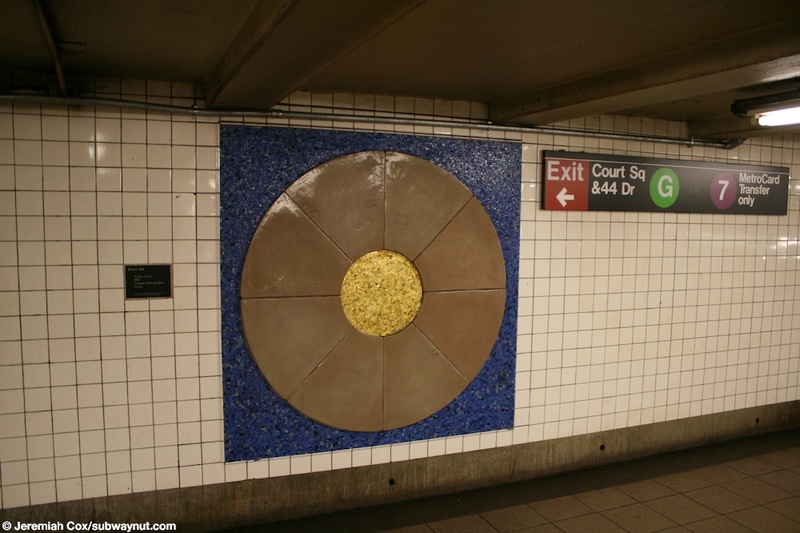 THe station is the last (or first) station in Queens before the IND 53 Street tunnel. 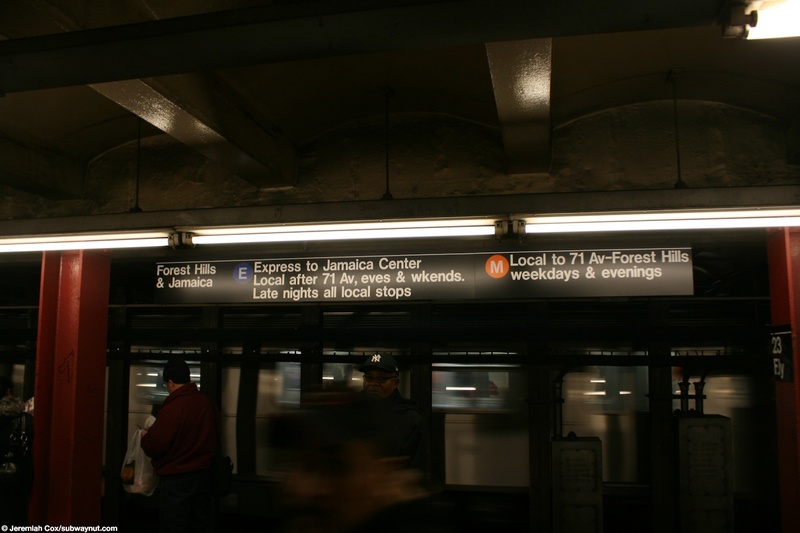 The station has two side platforms for the two track line. 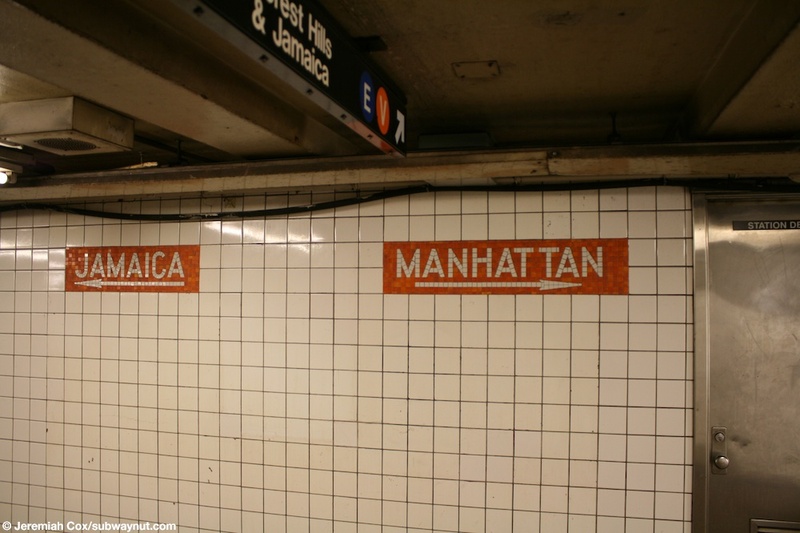 Each has a maroon trim, with black boarder. 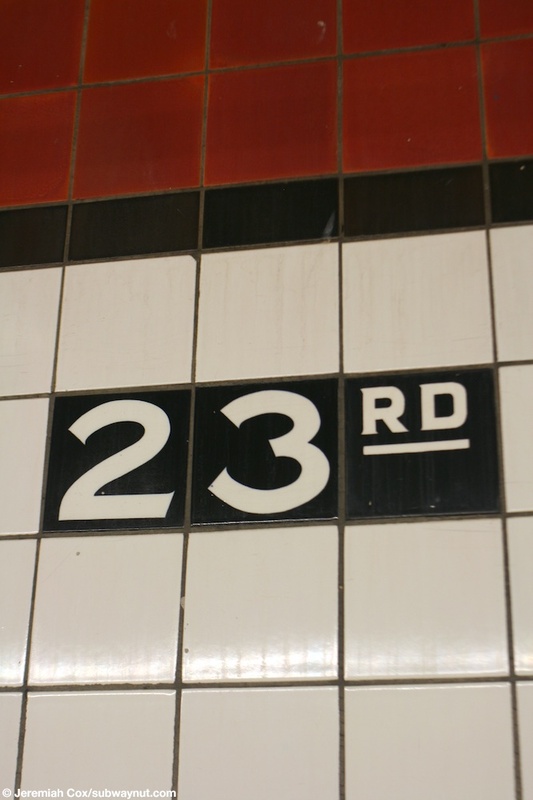 The name tablets that spell out 23rs St-Ely Ave, have a maroon boarder, with a background composed of a mix and of black and brown tiles. 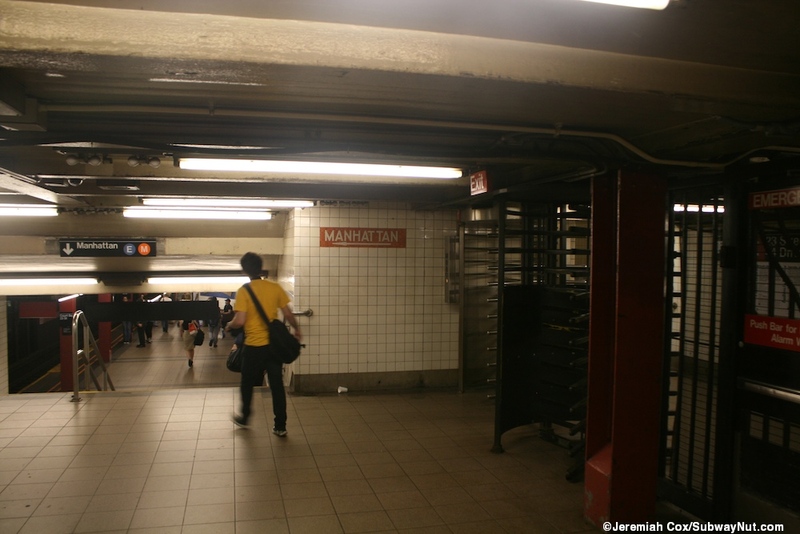 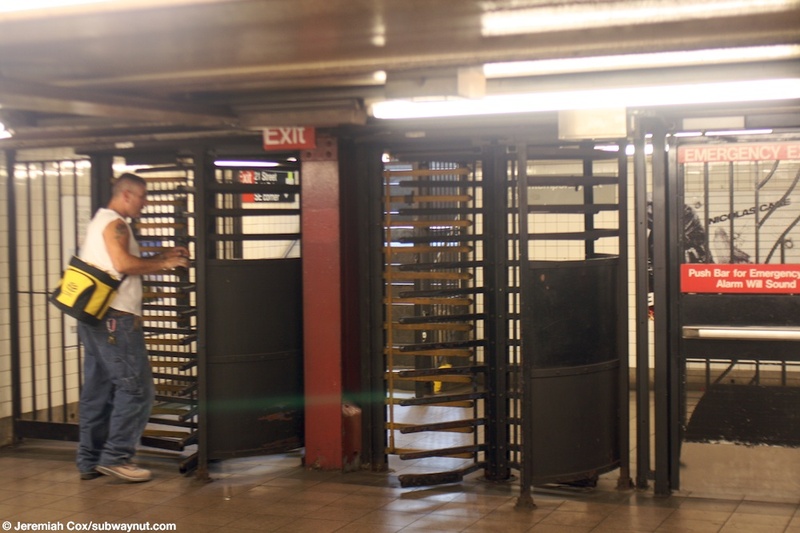 The station has two exits, one at either end of the station, each on on its own little mezzanine with a crossover. 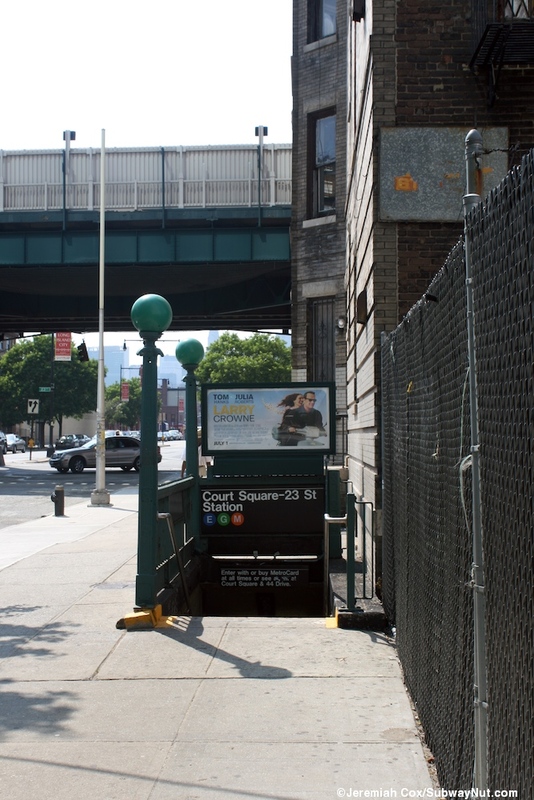 Each of these consist of a single staircase up from each platform to that lead to an intermediate landing (where the actual exit to the street is) followed by more steps over and forming the actual crossover. 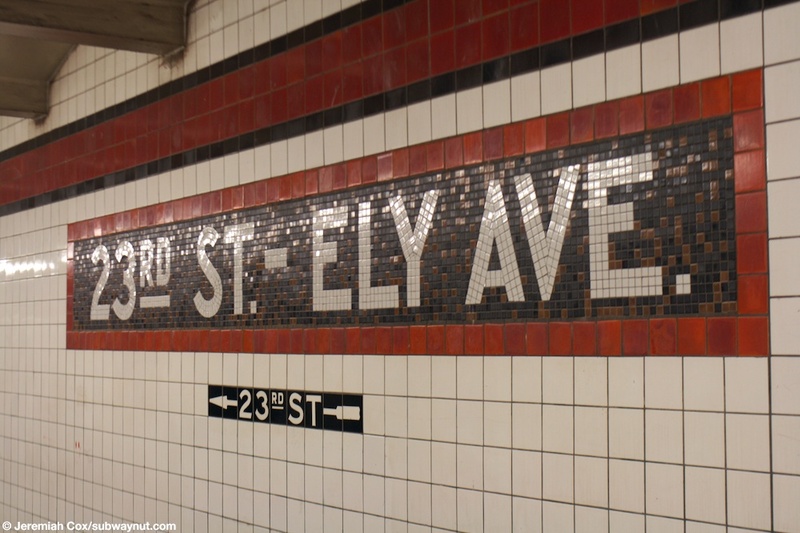 A 23 St-Ely Ave name tablet with a mosaic arrow for the exit to 23rd St beneath it. 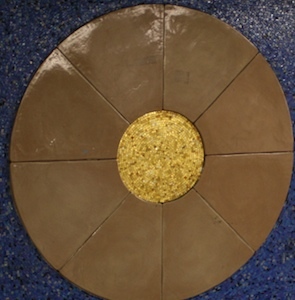 Ely one full tile beneath the trim. 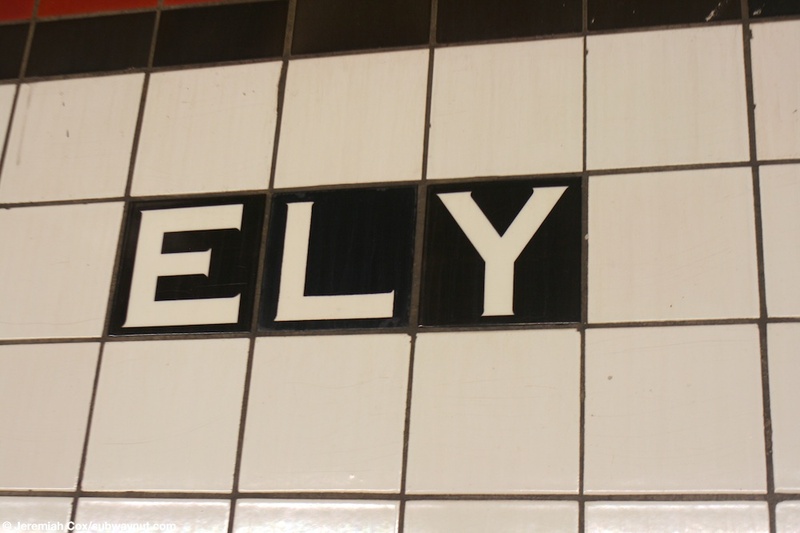 Ely alternates with 23rd in tile, one full tile beneath the station's trim. 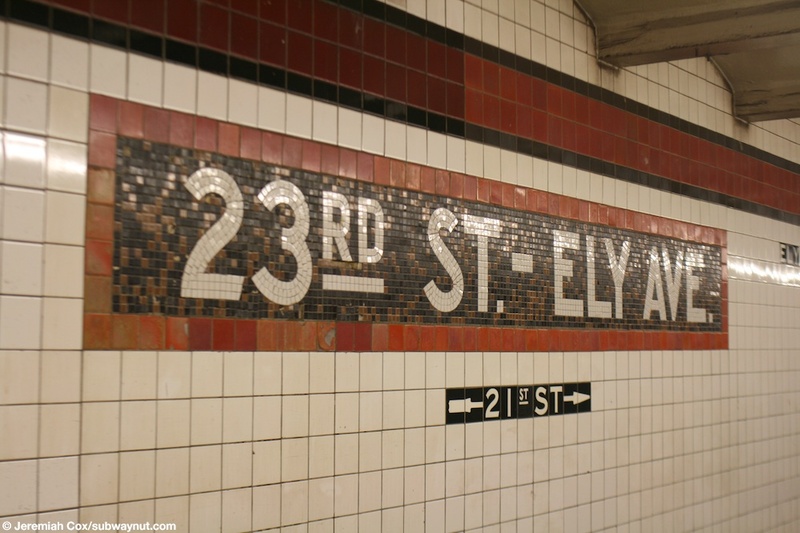 A 23 St-Ely Ave name tablet, the exit text beneath this one points to 21st St. 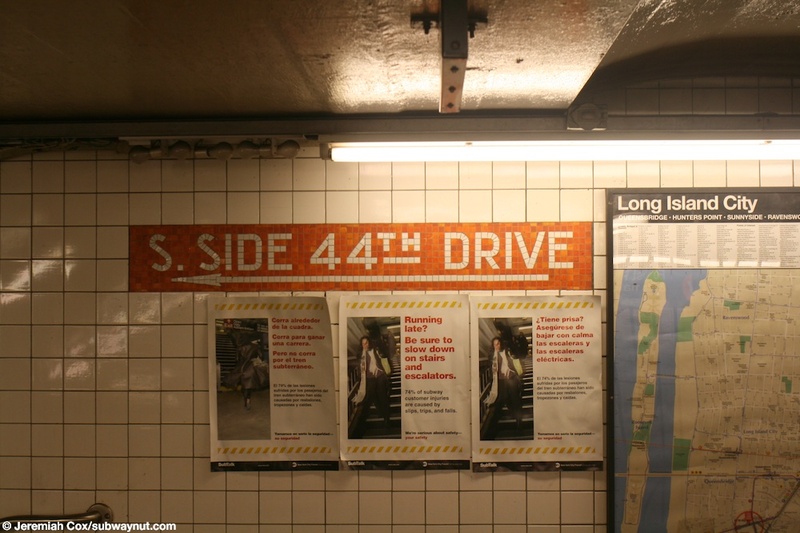 Looking down a side platform towards the 21 St & 44 Drive exit at 23 St-Ely Ave.
A mosaic sign for the S. Side 44th Drive at one of the exits at 23 St-Ely Avenue. 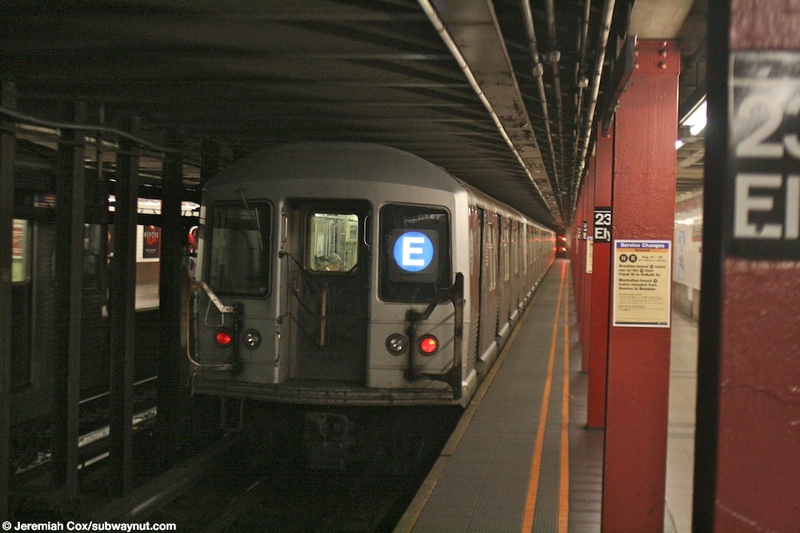 A R42 E train leaves 23 St-Ely Ave. 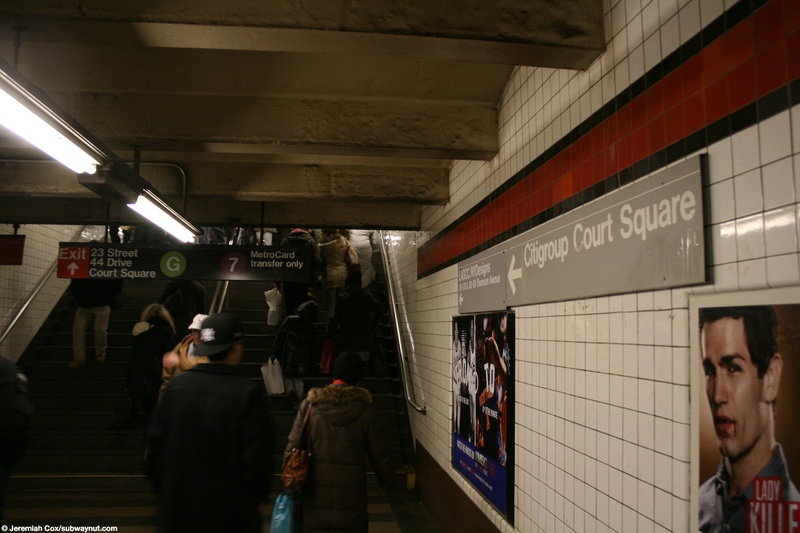 Looking up the staircase at the very western end of the platforms the main exit to 23 St-44 Drive and Court Square, with signs for the G transfer and 7 MetroCard Transfer only. 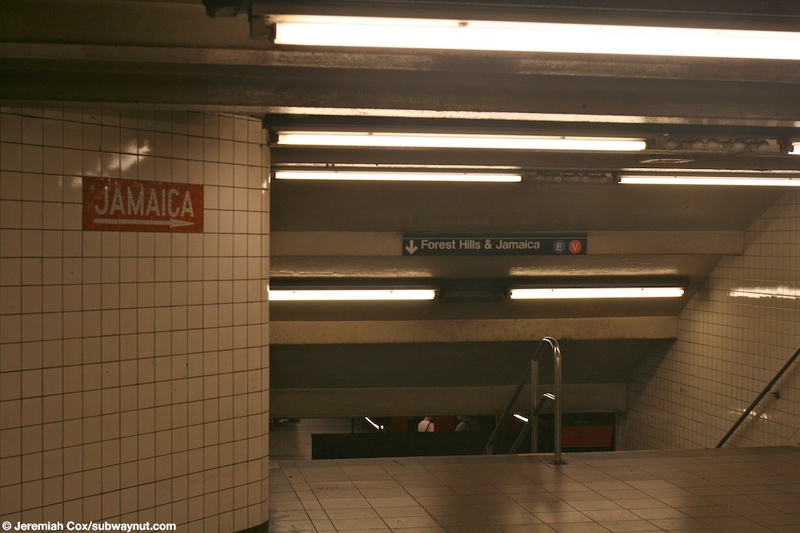 Looking down the single staircase from the main mezzanine area to the Forest Hills & Jamaica Platform, a tiled Jamaica sign also points at the staircase. 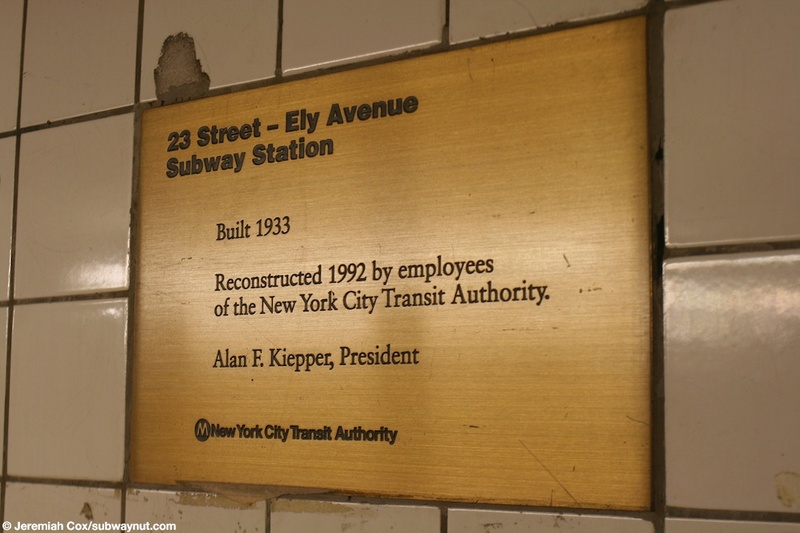 An Arts For Transit display on the mezzanine next to a sign for the exit and transfer at 23 St-Ely Ave.
Tiled signs for Jamaica and Manhattan on the mezzanine at 23 St-Ely Avenue. 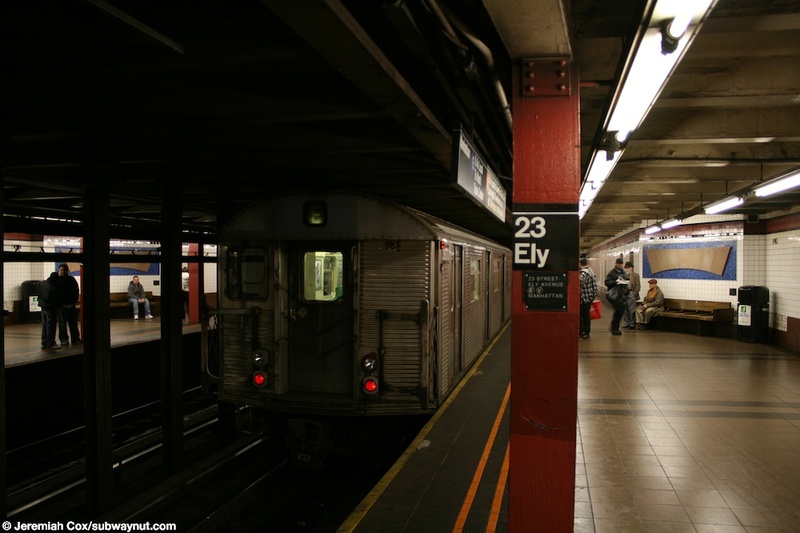 R4 #401 slows down to stop at 23 St-Ely Av on a special Holiday Nostalgia Regular Train service on the V.
R4 #401 stops at 23 St-Ely Av on a special Holiday Nostalgia Regular Train service on the V.
The E/M train service times sign at 23-Ely Avenue, no note on weekends for local stops to take the R train.